A powerful anti-pigmentation formula, this soap clears dark spots patches of your skin, as it cleanses it. English rose astringency and rich in vitamin C content that helps fade away the pigmentation marks, while mulberry's arbutin inhibits melanin synthesis, thus preventing pigmentation. Mulberry: Controls melanin production, prevents pigmentation. For external use only. Store in a cool dry place, away from direct Sunlight. Extract of English rose and mulberry, rose oil, olive oil, coconut oil, palm kernel oil. This is a dark Rose colour Bar looks like a yummy jelly bar and comes in a usual soap packing. I was expecting the soap will smells like a fresh Rose flower. But, this soap exactly smells like a hair removal cream, yuk. I don't like the smell totally. The colour of the soap looks Awesome and tempting. It lathers well and cleans the skin well. But, This soap is not like other Vaadi Herbals Soap which I have tried before.....because, other Soap won't leave skin dry or stretchy. This soap leaves skin little dry. But, It brightens my skin colour, that I can see after bath. Still I am not comfortable with this Soap. 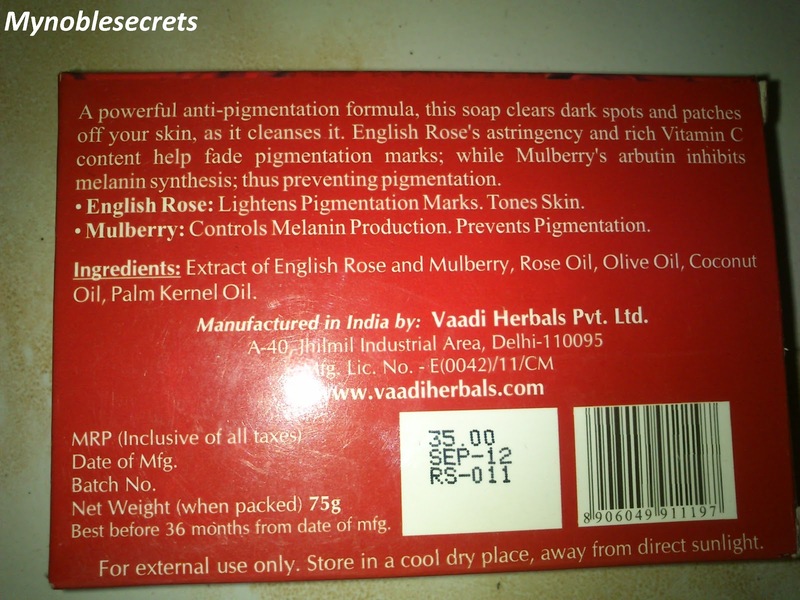 They claims anti-pigmentation which is not much visible even after using this soap totally. 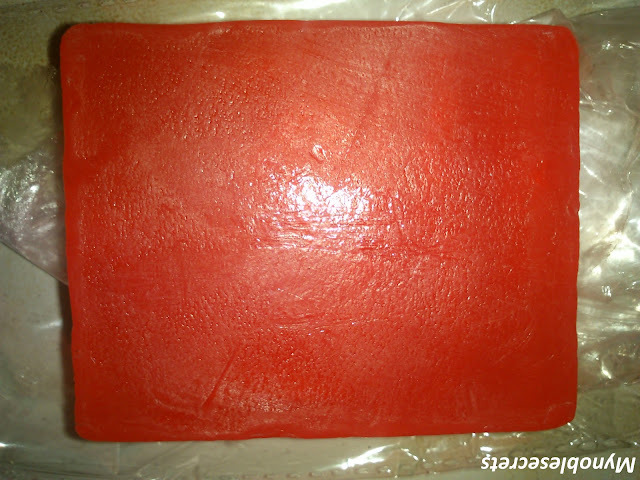 This soap has olive oil, rose oil, coconut oil which are good in skin moisturizing. But, this soap totally fails to moisturize skin and leaves skin little dry. Rose can do skin brightening really, but in this soap I think rose is inactive ingredient, otherwise this soap can smell nice and do what it claims. I loved Vaadi Herbals Indian Khus soap, Lavender soap very much. Good Handmade and organic Soap. It removes pigmentation up to some extent. I hate the smell totally. You must need Moisturising cream after bath. Not much visible difference in anti-pigmentation. I had great expectations about this Rose soap and it is totally a dud product, which fails to moisturize skin and doesn't do any Anti-pigmentation thing. So, I won't buy this soap again. It doesn't sound very good! It isn't good that it doesn't smell nice! The name is interesting but upon reading your reviews about it, I guess I have to pass on this one. I am concerned of the smell and of course it might worsen the dryness of my skin. smells like hair removal cream?? :P he he...!!! i love such soaps n have used couple of ones from fab India.. smells divine..
Great review Radha. I haven't tried any bath soaps from Vaadi, only their foot scrub. Will definiely check out the Khus one on your recommendation. 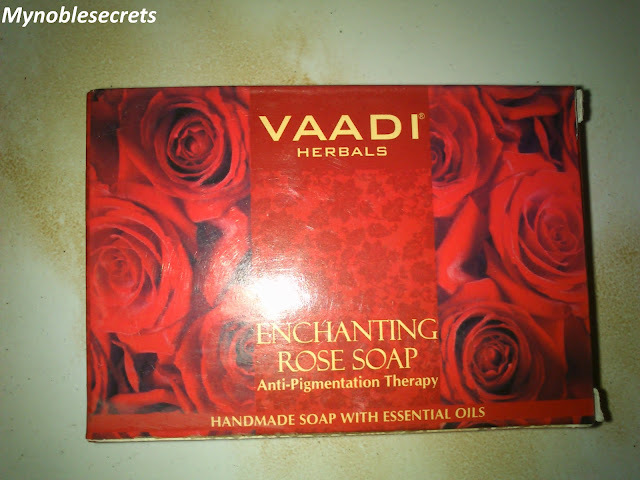 I do not comment, but after reading through a ton of responses here "Vaadi Herbals Enchanting Rose Soap Review". I actually do have a couple of questions for you if it's okay. Could it be simply me or does it look like a few of these responses come across like they are left by brain dead individuals? :-P And, if you are posting at other places, I'd like to follow you.